Have you ever wondered if you could substitute yarn in a pattern? Perhaps you have finally found a pattern for that gorgeous yarn you bought on vacation but are curious to know if you can safely substitute it for the recommended yarn. Even if you’re lucky enough to find a pattern you love written for the same weight of yarn as your favorite yarn—what about the fiber content? There are many factors to consider when attempting to substitute yarns. Pilling: This occurs when the fiber rubs against itself or another surface. Short fibers work loose from the yarn and tangle with ends of other nearby fibers forming little fuzzballs which can only be pulled free by breaking the fibers that hold them. Washability determines the ease of care of the particular fiber. It’s ALWAYS wise to wash and block a test swatch, treating the test swatch the same way you plan to treat your finished garment. Check the test swatch for shrinkage too. Heat Retention: A fiber’s warmth is determined by its ability to retain body heat. Elasticity: This refers to “stretchiness” of a fiber. Fibers vary in how much they can stretch or elongate before they break. 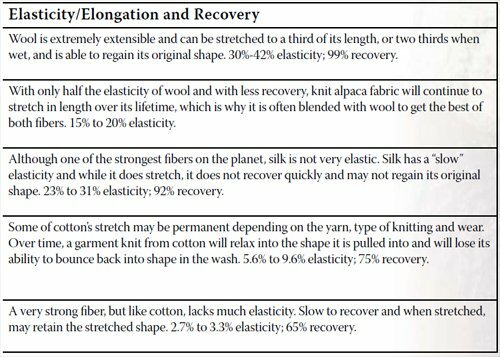 The ability of a fiber to resume its original shape after it has been stretched is known as “elastic recovery.” The elastic recovery helps the garment regain its shape and prevent it from becoming saggy and baggy. The table below outlines fiber qualities and differences that can affect the outcome of their use in a garment. Judicious fiber blends can capture much of the benefits of the component fibers while minimizing or off-setting their weaknesses. Is 100% alpaca too hot for you? Try a wool/alpaca blend in which the alpaca beefs up the wool’s heat retention ability a notch or two. This blend will also be more likely to retain its shape in the long term because of the super elasticity of the wool. A wool/cotton blend will be cooler than wool, but more elastic than cotton. Superwash wool has been specially treated so that the scales on the individual fibers lie down smoothly and don’t interlock with each other. This keeps the wool from felting and enables it to be machine washed. 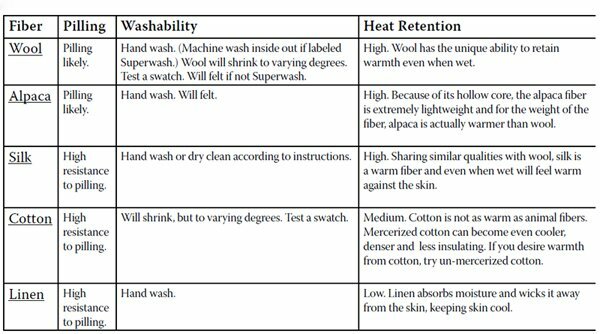 The best way to care for superwash wool in your washing machine is to turn the garment inside out and wash it in cold water, preferably on a delicate cycle if you can. The wool will not felt, but this special attention will help keep it from shrinking and from pilling as much. Nylon is frequently added to wool for sock yarn. The durable nylon extends the life of the wool, helping the yarn stand up to the regular rubbing socks get in the heel and toe areas. Cotton sock yarn usually has a little bit of elastic in it to help compensate for the lack of elasticity in cotton. We all want our socks to fit snuggly and not sag, so that is the benefit a touch of elastic adds.